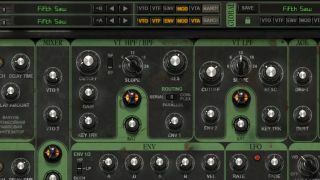 If you're not comfortable with the idea of using synth presets - or even if you are - the customisable randomisation functions built into many virtual instruments give you a way to use them as starting points for your own patches. This can not only save you time, obviously, but also leads to results you wouldn't get programming a preset from scratch, as the established settings maintain their influence on the sound. Here's how it's done. For more on making the most of synth presets, pick up the September edition of Computer Music. Step 2: Vacuum Pro’s randomisation controls are in the Master section. Here, we can independently randomise parameters in the Oscillator, Filter, Envelope, Modulation and Output Amplifier. Clicking the button will turn off randomisation for that section of the synth. In Part A, we click VTO and VTA to disable randomisation for those sections. Step 3: Now hit Part A’s Randomise button to randomise the filter, envelope and modulation settings. If you don’t like what you hear, keep clicking that Randomise button until you find something good. Narrow down your randomisation by disabling sections as you go.